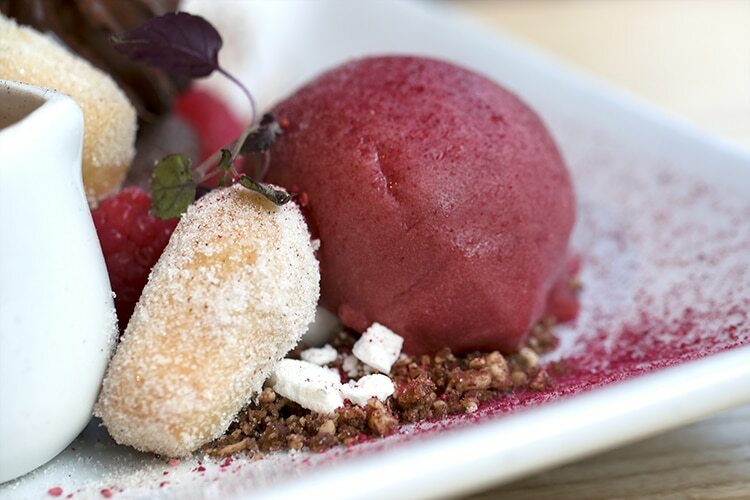 If you’ve eaten at Terre à Terre you’ll know why it’s been such a culinary success for the past 24 years. 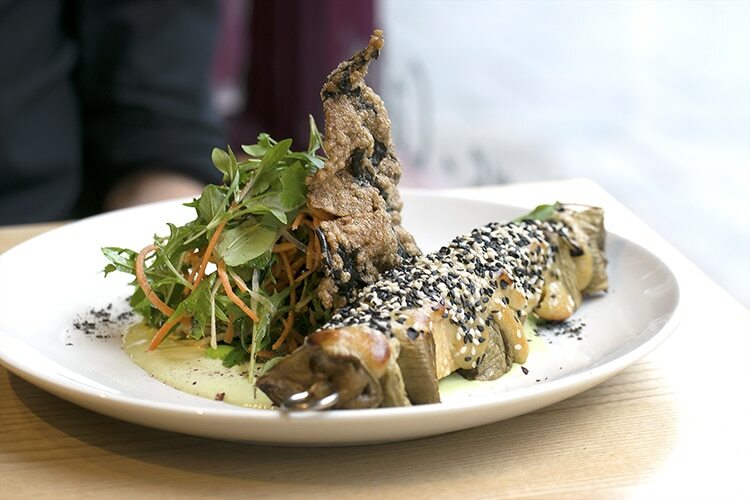 It has become one of the most innovative & exciting vegetarian restaurants in the UK, always surprising you with every visit. Classically trained chefs, Amanda Powley & Philip Taylor, started Terre à Terre as a BYO, seating up to 30 people. It’s come a long way since! Many people think that a meal that doesn’t contain meat, dairy or eggs will be a sad affair. This has been most people’s opinion up until recently, now that there are growing numbers of restaurants offering vegetarian and, sometimes vegan dishes, which have really had as much thought put into them as the other dishes on the menu. Vegetarian options are gaining their numbers, but vegan choices are still lacking, like how vegetarian options used to be. 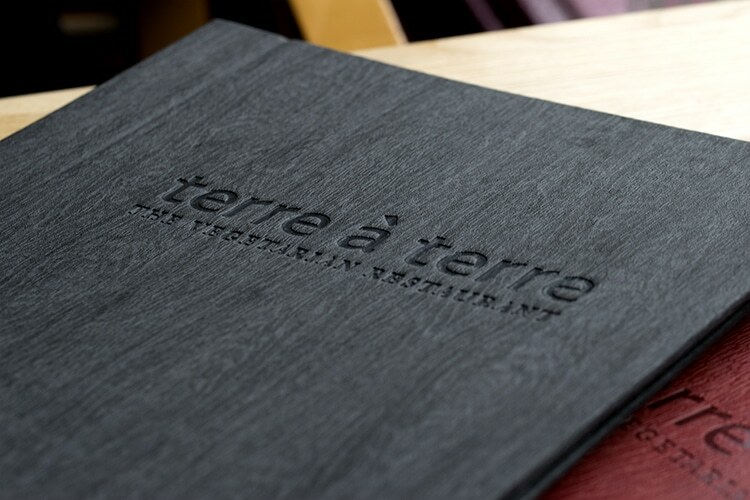 In refreshing contrast to this, Terre à Terre is a prime example of a restaurant offering a vegetarian menu with the option to make most dishes vegan. The fact there isn’t any meat used on their menu is secondary to the shear skill, creativity and flavours the chefs master. The menu is fun to read through, with creative names for dishes and plenty of puns. Abundant care and attention has gone into every detail at the restaurant, and the writing style of the menu encapsulates the Terre à Terre experience; playful fine dining with a dose of the unexpected. To start the evening off, we had the most genuine warm welcome. Terre à Terre clearly take a lot of pride in their excellent customer service. Andy, our waiter, was really easy to get along with and seemed to have a sixth sense for any questions we had. He knew the menu like the back of his hand, even down to how the dishes were prepared when I later asked how the aubergine was made. We were sat in front of the floor to ceiling street window. The restaurant had diners finishing their meals up around us as we arrived and shortly after, people were spilling in and filling up the tables. 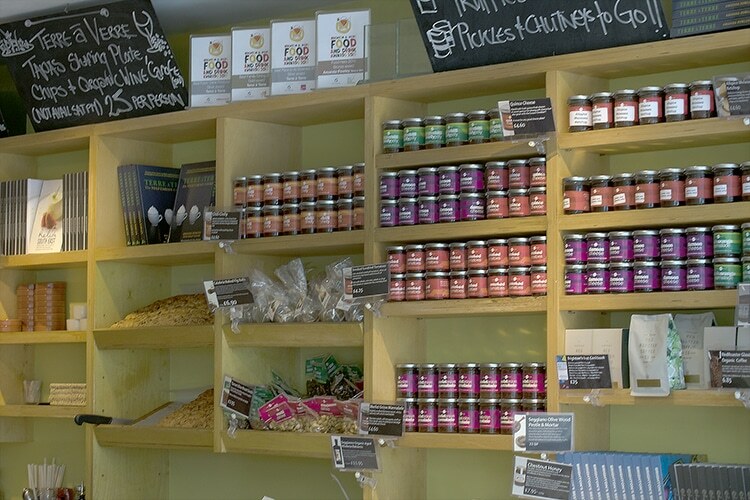 There’s a whole wall with shelves of jarred foods such as preserves and condiments, chocolate truffles and lots more, which are made by Terre à Terre. This gives you the opportunity to buy something you loved on the menu and continue enjoying it at home. Shortly after sitting and making ourselves comfortable we were offered a few nibbles to try, and we ordered an organic cider, which was cool, refreshing & the right amount of sweet with a hint of fizz. 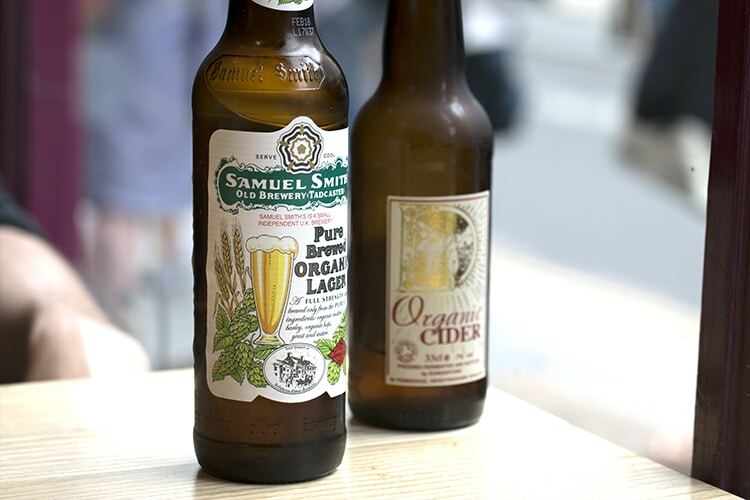 An organic lager was ordered on the other side of the table, this was from the Samuel Smith brewery based in the UK. -Crispy Fried lavash bread with dreamy dukka dust served with salt lemon skordalia and charred aubergine zhuganoosh (this was a taster pictured). Everything was delicious! What really stuck out for me was the sun-dried tomatoes, which were the most flavoursome tomatoes I’ve ever tasted. They really were smokey, too. I might have to go back to see if they sell them by the jar as I’m already thinking of plenty of recipes I could make with them. The cashews were slightly caramelised and had just a hint of wasabi, which was a good balance because sometimes wasabi can be a little overpowering. The dukka was so crunchy and seasoned beautifully. All of these nibbles were just making me even more eager to try more! 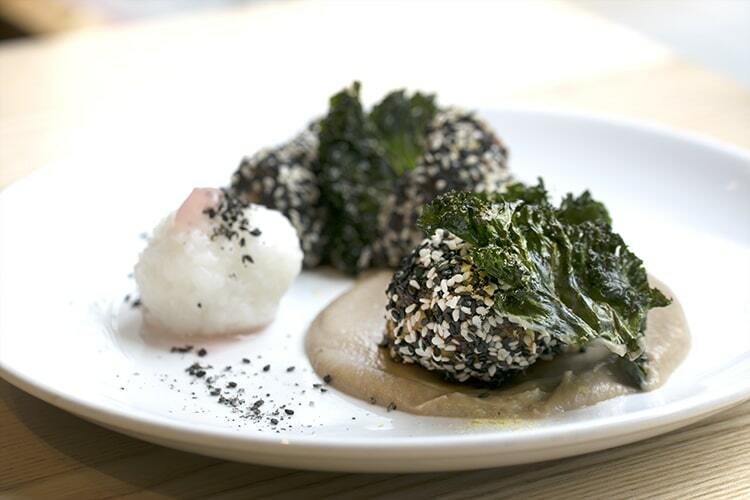 Korean fried cauliflower with sweet and sour sesame, onigiri rice, soused shiso dikon and khol rabi, pickled mirin ginger jelly and green leaf salt dried chips finished with chestnut purée. When it arrived the presentation was too good to eat, I was enjoying photographing it so much I had to stop before it went cold! The crispy, sticky, melt-in-the-mouth coating on the cauliflower was something I wanted to eat more and more of. 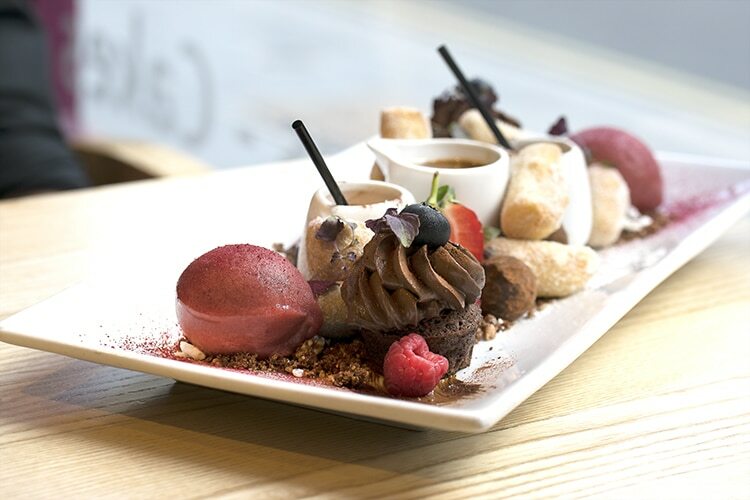 We had decided to share a starter, so as to have room for something sweet at the end, and boy was this hard to share! 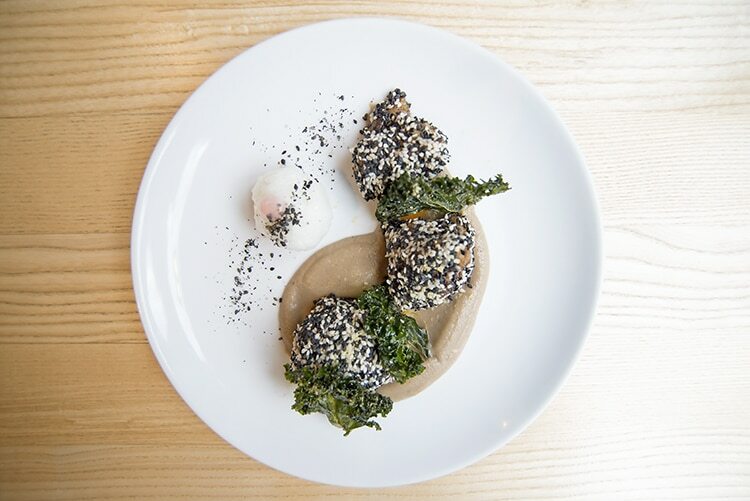 The kale crisps couldn’t get any crispier, and the chestnut puree was a subtle addition to the dish to harmonise the flavours and textures. The mains were both as amazing as each other. There are many elements to Terre à Terre dishes, and if you’ve seen their cook book you’ll know how many component parts, ingredients and methods are used in serving one dish of food. 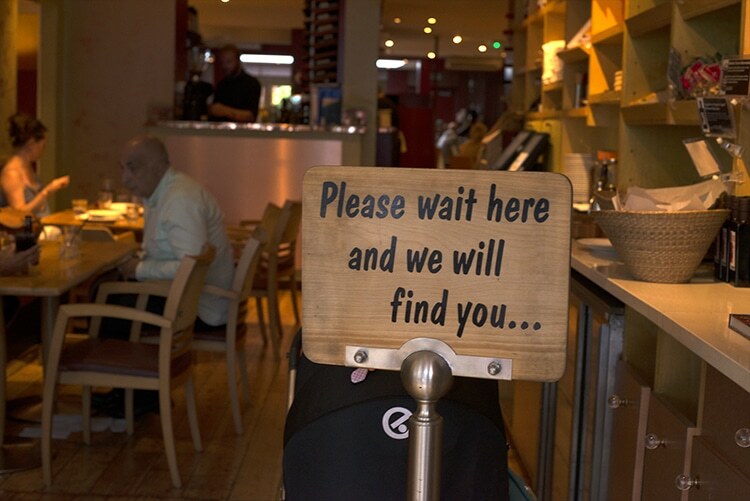 This means you won’t ever get bored of your meal, as there’s always a new combination you can try for each fork full. Potato rosti bursting with fresh turmeric, ginger, coriander and black mustard seeds flavours. Heaped with podi toor spice paste, packed spinach and pachadi pickle of preserved garlic tamarind tomato. Served with coconut yogurt raita and tandoori smoked tofu finished with pickled pink onion and green chili slivers and good temper. The colours of this plate just put a smile on your face, then when you taste it that smile gets even bigger. 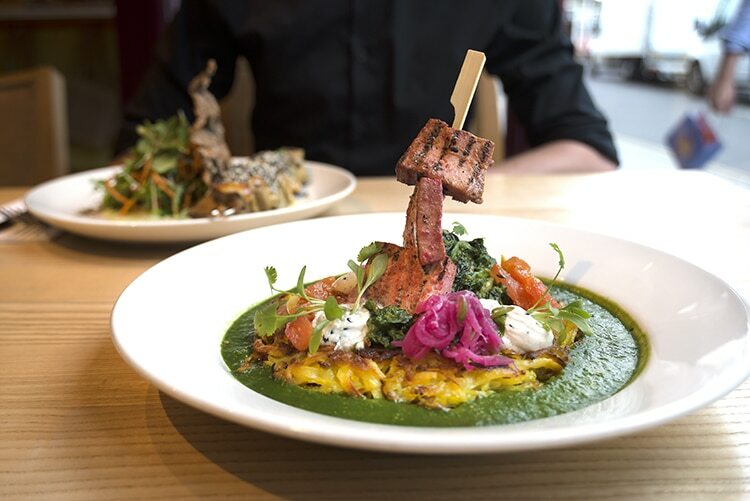 Terre à Terre know how to do a rosti, this one in particular is a play on Indian flavours. 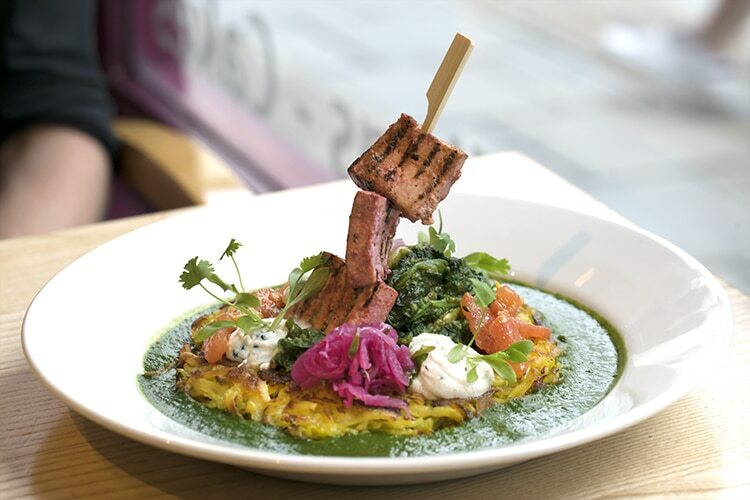 Andy was telling us that it particularly takes inspiration from South Indian flavours (one of my favourite cuisines). You’ve got a tangy, fresh tomato salsa with a punchy pickle alongside the coconut raita which boasts plenty of rich creaminess. 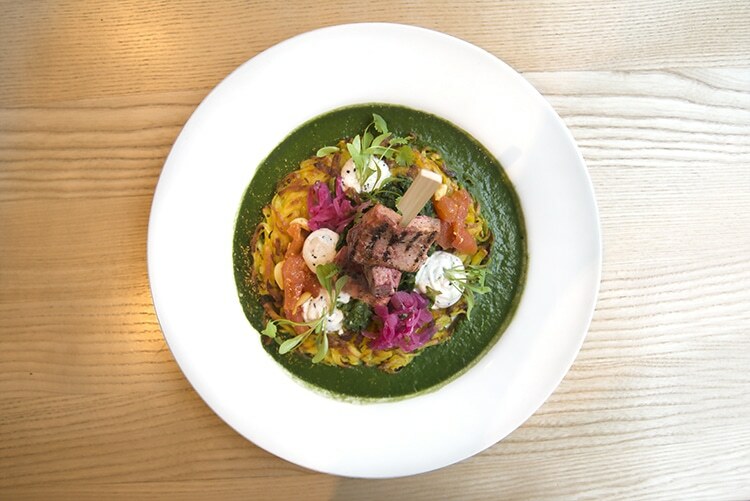 The crispy rosti has a slight saltiness which cuts through, and is sat on an earthy green sauce and garlic spinach. I loved the colour and chargrilled marks on the tofu, it sort of had the impression of something meaty, but softer and lighter. This dish was both our favourite! 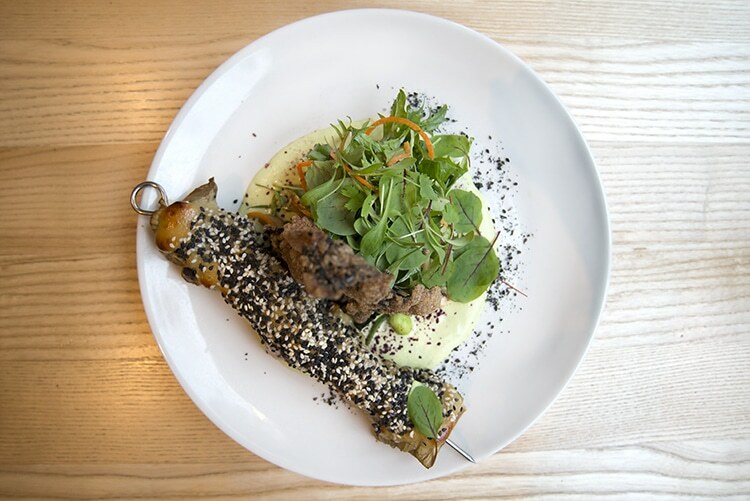 Steeped skewered and seared ume miso sweet ginger tahini aubergine and smoked tofu char, with toasted seed oil, black sesame salts and hibiscus juice served with amchur nori salt dusted puffed rice seaweed cracker, edamame, wasabi and yuzu pesto and wakame vegetable thread salad. This dish truly was a celebration of the aubergine. The aubergine skewer had chunks of the delicious vegetable which had been cooked in a way that wasn’t oily or mushy and yet wasn’t dry and foamy. It was a firm texture that had a bite to it yet would melt in the mouth, and the tahini sauce was rich and packed full of flavour. What I loved the most on the plate was the seaweed cracker, it looked like an aubergine skin inside the cracker, and it was so crunchy and crispy. It had a close resemblance in texture to pork crackling but less greasy. There was a summery feel to this dish, thanks mostly to the vegetable thread salad on top of the wasabi pesto and Asian ingredients. Chocolate hazelnut truffle cake & praline served with a whipped dark chocolate mousse and strawberry sorbet. 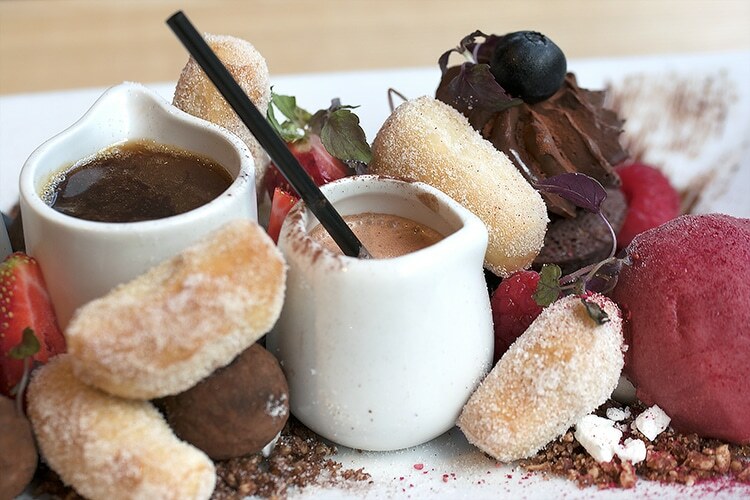 Mini cinnamon sugar coated churros with a chocolate salt caramel dipping pot and wild berries. 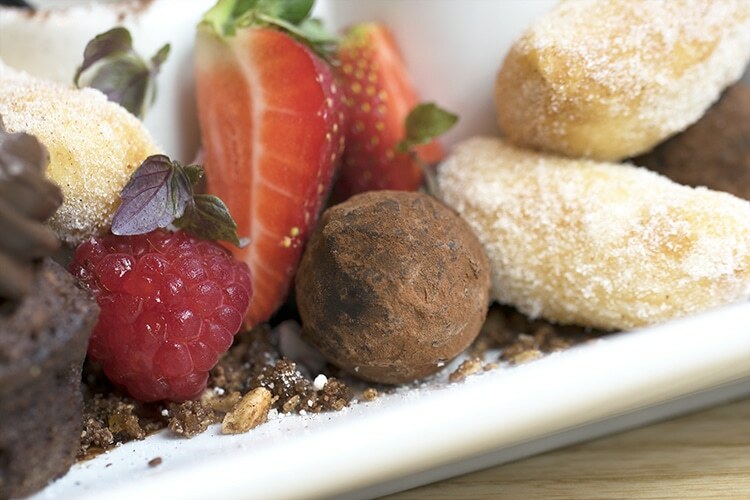 Crème de cacoa Brandy Alexander milkshakes, razza jazza truffles & rum truffles, all finished with raspberry sugar dust, baby sorrel and minty shizo shoots. Boy was this a dessert and a half! If you’re making your way to Terre à Terre soon, I would implore you to make sure to leave room to try this extravaganza of a dessert. 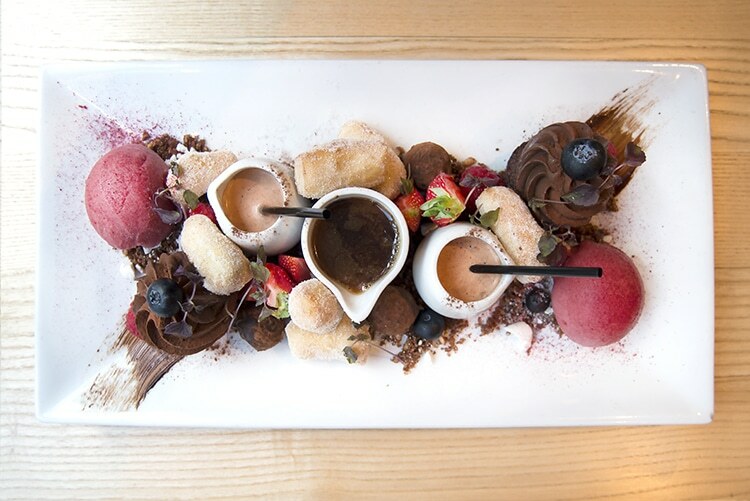 You’ve got a brandy milkshake to kick off with, mini churros to dip into a hot salted caramel chocolate sauce, plus a smooth fruit sorbet to cleanse the palate as you eat your way through. Boozey chocolate truffles burst in your mouth as you bite into them and the cakes are little sweet delights. 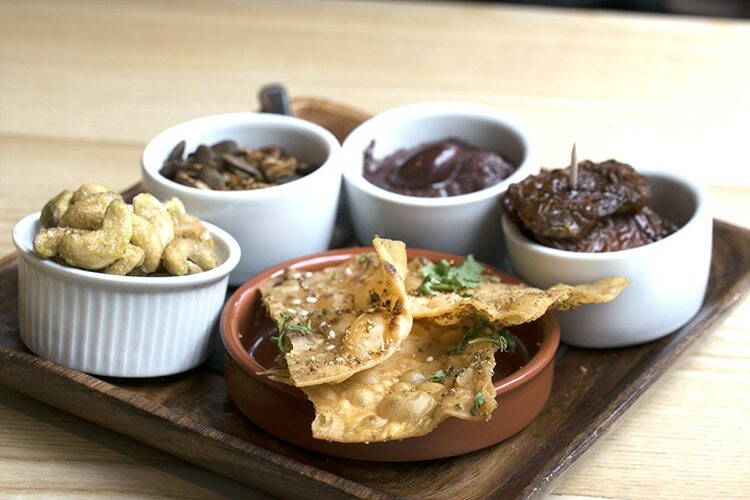 Just to bring it all together, there’s fresh fruit to dip & dunk along with a sprinkling of biscuity, crunchy nuts. If you’re a vegan then this is especially mind-blowing. It’s a novelty enough to get a great chocolate dessert as a vegan, but this puts ALL other chocolate desserts to shame, vegan or not. You won’t be able to eat it without moaning and laughing. Get it! I absolutely will make this the next restaurant I go to when I have a celebration or a special occasion. The service is impeccable and the food is remarkable. This is by far the best restaurant in town if you’re a vegan, and possibly even if you’re not. Go there!